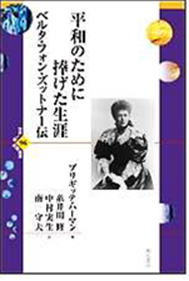 Brigitte Hamann’s book Bertha von Suttner: A Life for Peace has recently been translated into Japanese by Osamu Itoigawa, Mitsuo Nakamura and late Morio Minami was published in June (Tokyo: Akashi Shoten.) An ordering address is 6-9-5 Sotokanda, Chiyoda-ku, Tokyo 101-0021 Japan. They are also the translators of Lay Down Your Arms!